Charming floral prints and paisleys overstitched with vermicelli quilting for durability and surface texture, Antique Chic combines the comfort of 100% cotton with updated retro styling. Oversized for better coverage on today's deeper mattresses. Set includes: Quilt and two pillow shams plus two coordinating decorative pillows (one pillow sham and one decorative pillow per Twin set). Dimensions: Twin set includes one 68x88" quilt, one 20x26" sham, plus one 16x16" decorative pillow. Full/Queen set includes one 90x90" quilt, two 20x26" shams, plus two 16x16" decorative pillows. 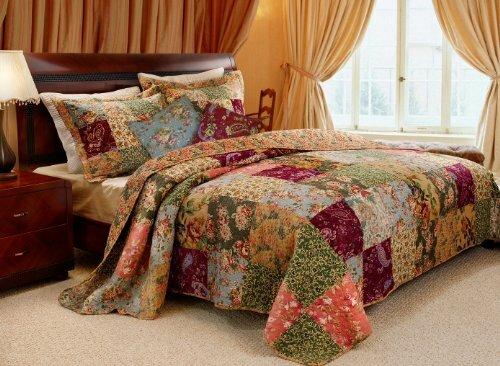 King set includes one 105x95" quilt, two 20x36" shams, plus two 16x16" decorative pillows. If you have any questions about this product by Greenland Home, contact us by completing and submitting the form below. If you are looking for a specif part number, please include it with your message.